When Jesus gave the Great Commission—to go to the world with the gospel—He didn’t give it as a theoretical possibility for anyone who might be interested. He gave it as a direct command—a personal commission to those He would leave to carry the gospel message as He ascended to Heaven. This Great Commission is not only God’s plan to reach the world, but it is His command to every Christian to personally share the gospel with the lost. Indeed, most Christians want to share their faith, but many wonder how. How do you initiate a gospel conversation? How do you share the gospel itself? How do you lead someone to a decision to trust Christ? And how do you explain baptism to a new Christian or lead them toward spiritual maturity? In this practical manual, learn how to share the gospel, how to follow up on new Christians, how to cultivate relationships with people not yet saved, and how to involve young Christians in growth and gospel witness. 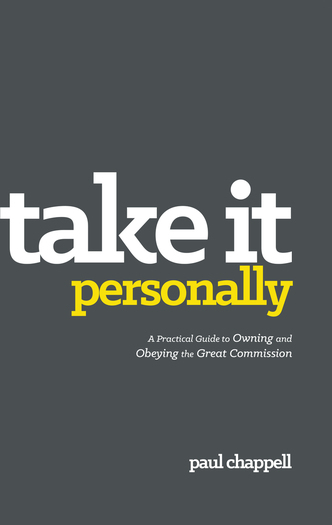 Take It Personally will encourage and equip you to own the Great Commission as your personal responsibility and to obey it as you share the life-changing message of the gospel.